Daar is geen bekende destydse portrette van Du Fu; dit is 'n latere kunstenaarkonsep. Du Fu (Gongyi 鞏義市, 712 – Xiangjiang, 湘江 770) (jiaxiang: Hubei, Xiangfan 湖北省襄樊市) was 'n Chinese digter ten tye van die Tang-dinastie. Cooper, Arthur (vert. ); (1986). Li Po and Tu Fu: Poems. Viking Press. ISBN 0-14-044272-3. Hung, William; (1952). 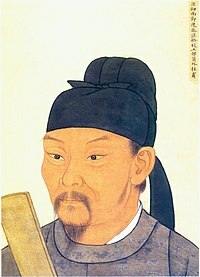 Tu Fu: China's Greatest Poet. Harvard University Press. ISBN 0-7581-4322-2. McCraw, David; (1992). Du Fu's Laments from the South. University of Hawaii Press. ISBN 0-8248-1422-3. Owen, Stephen (red. ); (1997). An Anthology of Chinese Literature: Beginnings to 1911. W.W. Norton & Company. ISBN 0-393-97106-6. Watson, Burton (red. ); (1984). The Columbia Book of Chinese Poetry. Columbia University Press. ISBN 0-231-05683-4. Watson, Burton (vert. ); (2002). The Selected Poems of Du Fu. Columbia University Press. ISBN 0-231-12829-0. Die bladsy is laas op 12 September 2018 om 08:56 bygewerk.